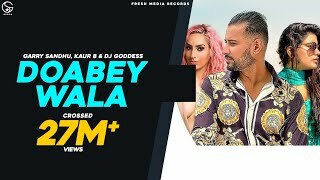 Doabey Wala Lyrics: The Punjabi song is sung by Garry Sandhu and Kaur B featuring Dj Goddess. The song has music produced by Ikwinder Singh while Doabey Wala Lyrics are written by Garry Sandhu himself. The music video is directed by Sukh Sanghera starring Garry Sandhu, Kaur B and Dj Goddess. Kehnda thodde naal saada "I labh ju <3"
Tu zara b... Bach ke.. This is Ikwinder Singh Production!